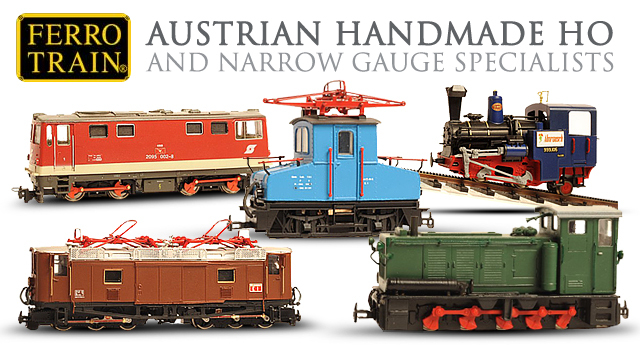 Ferro-Train is an old Austrian manufacturer that specializes primarily in Austrian HO Narrow Gauge models. They have the largest selection of Mariazeller and Zillertal locomotives and rolling stock. They also produce HOn3z narrow gauge rack and pinion locomotives, rolling stock and track modeled after the Scheeberg and Schafberg lines in Austria. Recently Ferro-Train purchased all of the HO tooling from the Polish manufacturer Tololoko, in which they will start producing high quality HO brass models. Ferro-Train models are mostly handmade in small quantities. Reynaulds is very excited about becoming the exclusive importer for North America.